Copyright © 2018 Share International. All rights reserved. The following is this month’s selection of articles on the website. Click here for the full table of contents from the printed magazine (end of this page). 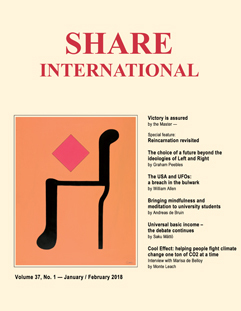 Since the inception of Share International magazine, Benjamin Creme's Master has provided articles to be published not only at the time they were written, but also whenever appropriate, according to world circumstances. Indeed, many of these articles seem more relevant now than when they were first published. This article, published in September 2009, warns humanity that there are still those "who plot and plan" for war with weapons of terrifying destructive power. "How long, we must ask, will it take man to realize that war solves nothing, proves nothing and adds only pain and loss to the peoples of Earth?" Benjamin Creme's Master also reminds us that sharing is the key and people power the way to bring governments to implement it. Twice, last century, the world was convulsed by total war, two terrible phases of one war which cost humanity many millions of lives. Each was meant to be "the war to end war", but still there are those who plot and plan for yet another trial of strength, with weapons of even greater destructiveness. How long, we must ask, will it take man to realize that war solves nothing, proves nothing and adds only pain and loss to the peoples of Earth? A major reason for the Masters' return to the everyday world is, precisely, to remind men of this, to so influence their thinking that they turn away from war for ever. So many nations today possess the nuclear bomb, the most destructive weapon ever conceived and built, that a future major war would be the ultimate horror: the complete destruction of life on planet Earth. For many millions of years Earth would be a dead planet, a toxic waste. Men, themselves, would have to incarnate on some dark, far-off world, and begin again the long, long journey into the light. You may be sure that when Maitreya, imminently, begins His open mission, He will face men with this problem and its outcome, and offer His solution and advice. War, He will remind men, is a blasphemy, a detestation and crime against all men, involved or not. War, He will say, must be considered thus if humanity and the lower kingdoms are to survive. Sharing and justice alone, He will say, will ensure the future for men. Strive for unity and co-operation for the men of Earth are One. "See your brother as yourself" and take the first step into your divinity. "Take your brother's need as the measure for your action and solve the problems of the world. There is no other course." Thus will Maitreya speak to the people of Earth. Thus will He endeavour to change the direction of their thinking. Will the people listen to and act on His advice? Fear and foreboding fill the minds of men: ancient habits of thought die hard and are loath to change. More and more, however, the problems and privations which accompany the economic collapse of today encourage men to seek new ways of living, and turn their thoughts to sharing, to the creation of a more just and generous world. Thus are many ready to respond to Maitreya's words. Many, of course, are not ready to change. Many are content with the present situation, expecting an 'upturn' in the markets before too long, when they will begin again to make money from air for their company and themselves. Many, too, in the religious fields, will welcome little the appearance of Maitreya. Bereft of knowledge, clinging to their man-made dogmas, they will find in Maitreya, the Lord of Love, the abomination of evil that they fear. But not all. Many religious groups around the world have seen and heard Maitreya's words before, albeit in another guise. They will remember the Teacher Who appeared to them and planted the seeds of sharing and justice in their minds, while endowing their lands with the Waters of Life from Aquarius. Eventually so great will be the pressure for a better, a fairer and a safer world that even the most bigoted will add their voices to the clamour for change. Thus will it be. At every lecture he gave around the world, and virtually every day of his life, Benjamin Creme was asked numerous questions covering a vast range of topics. We draw on this large recorded resource and publish answers provided by BC and his Master over the years, none of which have yet appeared in Share International, with the exception in this issue of those reprinted in the separate text box due to their current relevance. A. Yes, both directly and indirectly. A. (1) Yes. (2) Yes. (3) Yes. Q. How will people's consciousness change in future? At present people and politicians make fun of esotericism. A. It's a big question, but basically there are many powerful energies in the world now which will change men's consciousness. Not immediately, but gradually the energies will cause a huge change in human consciousness. Q. Can we meet Maitreya? A. Until He is known to the entire world, He has given us His 'Handprint', as a point of invocation. If you are in need, if you look at His 'Hand' for His help for your health, for example, He will respond according to the Law of Karma. "My help is yours to command, you have only to ask," He has said. Share International has a large reserve of letters which were confirmed by Benjamin Creme's Master to be genuine encounters with Masters, or a 'spokesperson', but which have not yet been published in 'Letters to the Editor'. Other letters presented here are new. While we cannot confirm or indicate if a Master is involved, the experience may be such that it 'speaks for itself' in providing hope, inspiration and comfort. (1) We left early in the morning to install our stand outside the walls of the castle of Vincennes (Paris region) to participate from 30 April to 1 May 2018 in the Wellbeing and Contemporary Arts Show. On Monday, the weather was exceptionally bad; cold with a strong wind and constant rain. Early in the afternoon, thinking of the gusts of wind and puddles on the muddy road preventing visitors from stopping in front of our stand, I decided to ask myself some questions. In all the 20 years of maintaining a presence at the shows, I've never asked myself these kind of questions, but considering the exceptional context which might prevent anyone from seeing the posters or feeling the energies around our stand, or to stop to consult our documents, I wondered about how useful it was to stay at the stand that Monday. As I was writing notes in our notebook, I felt intense heat all over the top of my head, and I looked up to see whether there was a heat source, which was impossible. Indeed, there was nothing, and, at that moment, I knew that Jesus had answered me; that's why it seems useful to share this story which is not spectacular or extraordinary, but is a very telling experience. (2) We took a booth at a Body and Mind show in Paris in February 2018 but a number of co-workers were not able to take part because of the bad weather; those present had struggled through the rain. On 9 February at the Parapsychology show, a co-worker joked: "We are forgotten because Masters or disciples don't visit us!" At 3.15pm, a pretty blonde woman with blue eyes stopped in front of our stand, put her finger on Maitreya's Mission Volume Two and asked me who Maitreya is. I invited my colleague to answer her. She had a Slavic accent; she said she had read all the books written by Helena Blavatsky and Alice Bailey. We thought it was a little doubtful, that she had really read everything. She said to my colleague: "It does not seem so, but I know a lot of things. How old am I, do you think?" My colleague answered that she could be 30 years old. She said that in fact she was 48 years old, and had been paralyzed, and so had had time to read. My colleague told her about Benjamin Creme's book The Gathering of the Forces of Light and about human evolution. The lady let him know that the human evolution is not only terrestrial but cosmic. Seeing that she was not interested in buying the books, I gave her Benjamin Creme's book catalogue, and she said that this was exactly what she wanted in order to remember Maitreya's name. Very determined, she bought a card of Maitreya's 'hand', and my colleague began to tell her that the hand is three dimensional, and she answered that he did not need to prove anything to her, because she sees beyond appearances. She said: "I am intuitive," and then she asked my colleague: "How is your heart?" This was troubling because my colleague has heart disease. And she said that he would get better. She asked him: "Are you here on Monday?" And strangely it was the day he was coming back. And she told him that she would see what she could do for him. My colleague offered to tell her about Jesus' appearance on the photograph taken at Necker Hospital, but we felt that she did not want to listen anymore; we handed her a photocopy of the text published about the photograph in Share International magazine [September 2002]. The photocopy was in A4 format, but she only had a blue cardboard file slightly smaller than this size. She delicately folded the part that went beyond saying that the little gestures of everyday life make all the difference. Then she left, saying: "I'll come back". While she was there, and also a while later, I felt warmth in my chakra. Half-an-hour later, she came back to the stand and gave me a broad smile and a wink. I think she was one of Maitreya's spokespersons. I suspected that it was all symbolic. She did not come back on Monday, but my colleague felt better. A friend suggested I write to you about a miracle after I called for Lord Maitreya's help in the fall of 2000. I was called to help my niece's sister-in-law Vida who had been ill with cancer, and in and out of the cancer center in Buffalo, New York, for one-and-a-half years. Now she was sent home as the malignancy was not responding to the treatments and had invaded all her insides, up her spine and nearing her brain. She was sent home to die. Her daughter called me crying, as the local oncology specialist had told them she would pass away as it entered her brain. All her family had been called, from Arizona and Florida. I entered a room at the hospital as they were all gathered around her praying, and saying goodbye. She was semi-conscious, swollen, puffed, hard and blueish. I put my hands on her head and prayed for help for a long time. She barely opened her eyes a little and said: "Am I going to be healed?" I said "Yes -- it's starting, Vida!" Then I thought "Oh God, don't let me give her false hope!" Several of her family followed me home and they received literature about the Emergence and their reaction was good. Vida lingered and started eating -- her doctor decided to have x-rays about 10 days later to see how fast the malignancy was progressing up her spine: Her brother called me -- I held my breath -- you can't imagine what joy I felt and thanksgiving when he told me "the Doctor is amazed, there is no sign of cancer in her body -- it was either the wrong diagnosis or divine intervention." They slowly stopped all medications and she went home. Her family had a celebration on 14 July with over 75 people attending the dinner. I know I was a channel and that was the third cancer healing. The others were not that extensive. My daughter says I have been re-conditioned as I had a quadruple heart by-pass two years ago, stents in my kidney arteries, a broken hip. I took care of my husband who became ill in World War II for over 40 years. I became a meditator and my doctor began questioning me as I did not age like others and he wondered how I could do so much (I am 88). He invited me to talk at his home and they all were happy to learn the Way! A statue of the Madonna in a private home in Mexico has been exuding oil since February 2018. "All day she is full of oil," said Rosa Ramirez, referring to the weeping statue in her simple home in Cuidad Juárez. What Ramirez considers a miracle began one day in February 2018. "That day I was very sick," she said. "I was very frustrated because of the pain.... I felt something, so I came to the Virgin." Ramirez had been diagnosed with cancer so she prayed for her illness to go away. "I noticed on her chin, there was a drop of oil," she said. "When I touched it, I noticed it smelled like roses." First there was a drop, then the Madonna began to weep. The statue's face and body now exude oil. Ramirez says she has been cured of cancer. Thousands have visited Ramirez' home to pray to the Madonna statue. Ramirez says many visitors have told her of cures of cancer and other illnesses after praying at the statue. On the night of 5 March 2018, almost at midnight, M.L. and her daughter, spotted at Santa Maria de Palautordera, Barcelona Province, Spain, an unusual light in the sky that behaved strangely, pulsating, changing colours and moving around. They took several photos of the object. Photos sent by M.L. On the evening of 14 April 2018 four aviation technicians witnessed (and one photographed) a glowing lens-shaped object fly over Mexico City International Airport. "It radiated an intense white light," reported technician Alfonso Salazar. "The sighting lasted some 15 seconds before the UFO simply dimmed its light, becoming a shadow moving across the sky. Five minutes later another object passed, projecting an intermittent white light.... These were UFOs, without question." Photo by E.T. of Okinawa, Japan, taken on 5 December 2006 on a train from Kanazawa to Wajima, confirmed by Benjamin Creme's Master to show a blessing from the Master in Tokyo. Blessing from the Master Jesus, confirmed by Benjamin Creme's Master, on a photo of S. K. of Kobe, Japan, at Mt Maya, Kobe, on 12 April 2006. Just before this photo was taken, a taxi she and her husband were in had an accident involving a student on a bicycle. They were all saved by the Master Jesus. For the full articles and interviews please see the printed magazine available via our offices in London, Los Angeles and Amsterdam. Edna Adan Hospital is a non-profit charity located in Hargeisa, the capital of the Republic of Somaliland. Edna Adan was founded in 2002 as a maternity hospital, and has since blossomed into a large referral hospital that serves the health needs of people throughout Somaliland as well as neighboring countries. It also partners with the republic's Ministry of Health, UNICEF, and the World Health Organization to train medical professionals including nurses, midwives, laboratory technicians and pharmacists. Somaliland, located in northwestern Somalia, has a population of 3.5 million people. Formerly the British Somaliland Protectorate, it merged with the former Italian Colony of Somalia to become the nation of Somalia in 1960. But after a prolonged civil war, it declared itself an independent state in 1991, and has a democratically-elected government. Somaliland is recognized internationally as an autonomous region of Somalia. Dr Edna Adan Ismail founded the Edna Adan Hospital and remains its director. She is also the founding president of the Somaliland Family Health Association. After her retirement from the World Health Organization she donated her pension and other assets to build the hospital in order to address the serious health problems that endanger the lives of women and children across the Horn of Africa. Jason Francis interviewed Edna Adan Ismail for Share International. Share International: Could you give a sense of what life is like for the people in the Republic of Somaliland, and some of the economic and health challenges facing the population? Edna Adan Ismail: Prior to the separation of former British Somaliland from former Italian Somalia [Somaliland's declaration of independence in 1991], the people of Somaliland suffered 31 years of neglect when their hospitals, schools, homes and economic potential were obstructed by Somalia. And when one thinks of a country that was leveled to the ground by the government of Somalia between 1982 and 1991, one can understand how all basic health and education services have suffered. Furthermore, the death and damage continued even after the cessation of hostilities through the casualties that were occurring as a result of landmines, and intentionally contaminated water wells and reservoirs. Even more damaging is the economic and political blockade and isolation that Somaliland has endured for 27 years as a result of its sovereignty not being recognized. This is a sovereignty which the people of Somaliland have every right to own. SI: What inspired you to found the Edna Adan Hospital? EAI: As someone who had a unique privilege to become educated, won a scholarship to study in Great Britain, and returned to Somaliland in 1961 as its first and only nurse and midwife, I saw at that time how well health services were functioning. Sadly, after the union with Somalia, things deteriorated, became abandoned, fell into disrepair and then were totally destroyed by the long civil war. As a UN World Health Organization representative in the Republic of Djibouti, I was sent on a monitoring mission to my home country in July 1991, two months after Somaliland separated from Somalia. During that mission, I witnessed first-hand the total destruction of the country. That made me decide to come back to Somaliland and share whatever knowledge and resources I had been privileged to have during my career with the World Health Organization. Since I was also about to retire a few years after that first visit to my destroyed homeland, I decided that I would work towards making that dream a reality. To make my dream come true, I cashed in my UN retirement benefits, repatriation grant, any household items that I no longer had any need for or could not use in Somaliland, such as my Mercedes, items of jewelry and objects that I had at one point found beautiful, glamorous or fashionable. All of this was recycled into cash. I then came home and built the hospital. My biggest inspiration came during my missions to Somaliland when I would see hospital wards where I had once worked in a total state of destruction and home to sick people who had no nursing or medical care. SI: How large is the population served by your hospital? EAI: The hospital was built in a poor area in the city of Hargeisa where there had never been a hospital before. The official area served by the hospital covers about 1/3 of the [1.1 million] population of Hargeisa. However, our patients come from all corners of the city as well as from other regions and districts in Somaliland and beyond, as far as Somalia, Ethiopia and Djibouti. I hope that our expansion is due to the quality of care that we provide to the patients who seek our help and because we are the only non-profit charity hospital in Somaliland. A number of poor patients are treated for free, particularly women in labour who are having difficulties, or children in an emergency situation. SI: What do you consider to be some of the major achievements of the hospital since its founding in 2002? EAI: The training of a large number of health professionals, empowerment of women into senior health professional positions such as surgeons, medical doctors, midwives, nurses, public health professionals among others. We have improved the status of women. In 2002, 98 per cent of the women we delivered had type 3 FGM [Female Genital Mutilation]. Today that figure is down to 70 per cent. It proves that FGM is, for the first time, in decline. I was Somaliland's first female cabinet minister between 2002-2006, and this has opened doors to many women to become appointed to cabinet positions and to head government departments. SI: Could you talk about what it has been like for you on a personal level to serve people in need over the years? EAI: It has been a most gratifying and often humbling experience that with so little we could achieve so much. These achievements have been far beyond my expectations. My vision had been to set up a small maternity hospital! To have been ranked 13th among the best hospitals in Africa was definitely the highlight of this experience. In addition, to have Edna Adan University become ranked among the top three universities in Somaliland is a great honour, in particular as it is the only university founded by a woman. Internationally, the hospital has put my country on the map, the women of Somaliland on the map, and the importance of maternal and childcare on the map. And it has given hope and encouragement to many who otherwise would have felt hopeless. The talent and capacity that has emerged from many of our graduates has encouraged them to know that they can achieve anything and grow to their fullest potential. They will not be held back simply by being women who are living in a country that is not politically recognized and that has been destroyed by a prolonged civil war. The capitalism of today is surely dying. Greed and exploitation have over-reached themselves. A society where the wealthiest one per cent now owns more than half of the world's wealth, and which is destroying the very planet we live on, is not sustainable. Too many are left behind and will not tolerate it forever. The voice of the people is getting louder and will be heard. May 2018 marks the 200th birthday of Karl Marx, father of communism, that system which has been held up both as a model for good societal relations and as a now failed, cruel totalitarian system of government. Rule by the people for the people turned out to be a sham -- the revolutionaries became the rulers and turned on the people. There was no freedom. But under our capitalist state now, there is only ostensible freedom for the very many, even in rich countries, who struggle to barely make a living. In the UK, one of the richest countries in the world, food banks and people sleeping on the street have become almost acceptable, they are so familiar. Neither are the rich really free, always in fear of losing their wealth. But outrage -- even in this conservative country -- is growing. The Communist Manifesto by Karl Marx and Friedrich Engels was published in 1848 and is now re-issued with an interesting introduction by Yanis Varoufakis, Greek economist and politician. He hails the Manifesto as an inspiration to collective action for a better future "urging us to become agents of a future that ends unnecessary mass suffering and to inspire humanity to realize its potential for authentic freedom". "Liberty, happiness, autonomy, individuality, spirituality, self-guided development are ideals that Marx and Engels valued above everything else. If they are angry with the bourgeoisie, it is because the bourgeoisie seeks to deny the majority any opportunity to be free. Given Marx and Engels' adherence to Hegel's fantastic idea that no one is free as long as one person is in chains, their quarrel with the bourgeoisie is that they sacrifice everybody's freedom and individuality on capitalism's altar of accumulation." Water is a connection that we have with every living thing on Earth. Access to safe water can generate education and work prospects by improving health for women, children, and families, thus turning challenges into opportunities. The UN's Sustainable Accessible Development Goal for water and sanitation, Goal 6, calls for universal and equitable access to safe and affordable drinking water by 2030. But we are also told that by the year 2025 half the world's population will be living in water-stressed areas. That means that by the time that Goal 6 is achieved, half the world's population will already be living in water-stressed areas. The responsibility to collect water rests mainly -- and literally -- on the shoulders of women and children, who tend to be the gatherers of this vital resource. The United Nations Children's Fund (UNICEF) states that women and girls spend 200 million hours every day collecting water. Not only is this a waste of their time, but it also locks women into a cycle of poverty; the amount of time spent collecting reasonably safe drinking water takes away from time spent on education, work, or other self-empowering activities. The United Nations Children’s Fund (UNICEF) states that women and girls spend 200 million hours every day collecting water. Two students, Jit Patel and Rutu Mehta, from the University of Alberta, Canada, decided to take action. Rutu Mehta is 21 years old and currently studying towards a Business Economics and Law degree with a minor in Finance. Her plan for the future is to become a corporate lawyer as well as to see Aqua Caelum grow into a company that can help millions of individuals around the world. Jit Patel is also 21 and currently studying towards a degree in Mechanical Engineering. His future goals include getting an MBA degree and making Aqua Caelum a highly successful company that can help millions. Together, they co-founded the company, whose mission is to "end the water crisis and give millions of individuals access to clean water". Essentially, they aim to "stop the walk". Their research and efforts culminated in the "Atmospheric Water Generator" (AWG) system, which works much like a dehumidifier. Using thermodynamics, it pulls water droplets from the air and then runs the water through a filtration system, creating clean drinking water. Michael Tayles interviewed Jit and Rutu together for Share International to discuss their invention that they hope will help with the global water crisis. SI: How did the idea for the AWG come about? The idea came to us in the summer of 2017, when we noticed that there was a recurring theme in the headlines of several media outlets. This was the water crisis. Major metropolitan cities like Cape Town were facing water scarcity and it wasn't something that was going to happen in 10 years, it was something that was happening now. After doing research we found out almost one billion people don't have access to clean drinking water and, according to the UN, two thirds of the population will face water scarcity by 2025. This is when we realized something had to be done and we decided to come up with a solution that could provide millions of individuals with clean drinking water. SI: How does the AWG operate? Essentially what the AWG does is condense water from the air. So as hot humid air passes over cool coils, it condenses the water molecules trapped in that air. The condensed water is filtered for consumption. The process is identical to a dehumidifier. SI: How many litres of water can one AWG produce and how long does it take to make that amount? Currently, we are looking to produce 20 litres of clean drinking water in a day so that individuals do not have to drink polluted water. As we continue to research and develop the product, we aim to increase this capacity to aid more individuals. 6 'Where no man lacks': a post-capitalist order?